Symmetrix VMAX systems are configured with vault drives on back-end Fibre Channel loops. Vaulting is the mechanism used to protect your VMAX data when: 1. powering down the array, 2. a power outage occurs or 3. in the event some environmental change such as an air conditioning failure occurs resulting in ambient temperature being exceeded (VMAX Operating temperature is 59-90F | 15 to 32C). On a failure of the array the SPS’s maintain power to the array for 300 Seconds, this allows the VMAX to write the data in global cache memory to the Vault devices and to shutdown the array in a controlled manner. Two copies of the cache memory is written to independent vault devices allowing for a fully redundant Vault. Successfully writing all data in cache memory to Vault devices is very important in ensuring the consistency of application data stored on the VMAX. 1. The first part of the vault process is to stop all transactions to the VMAX. Once all the I/O is stopped the directors will then write all the global memory data to the vault devices. Shutdown of the VMAX will then complete. 2. The second part of the vault process is restoring the cache memory from Vault. During this process the array will re-initialize the physical memory, check the integrity of the data in Vault and then restore the data to global cache. The VMAX resumes operation once the SPS’s are sufficiently recharged to support another Vault operation. ◆All drives types can be used for vault. Vault is supported on EFDs, however if your Enginuity code level is below 5875 configuring Vault devices on Flash drives is not supported although Flash drives are supported at Enginuity 5875 but they require an RPQ. Ideally Vault would be placed on less expensive drives than EFD. ◆ The vault space is for internal use only. No other device can reside in this space. ◆ Five vault drives per loop are required to enable sparing. ◆VMAX 10K – Five drives per loop containing vault devices are required on the first four loops of each engine. ◆ VMAX 20K/40K – Five drives per loop containing vault devices are required on all 8 loops of each engine. two logical copies of the persistent portion of physical memory. 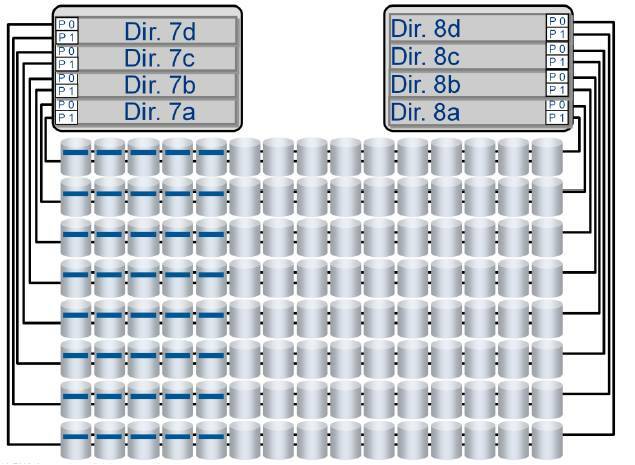 For EMC VMAX Vaulting considerations please reference EMC KB78550 – Vaulting in Symmetrix considerations and basic checks to be performed.